Jodie, a former major-league pitcher with both the New York Yankees and San Diego Padres, first joined the Patriots in 2003 as a player and has been in the organization ever since. He served as both the team’s pitching coach and director of player personnel until replacing now manager-emeritus Sparky Lyle as the club’s skipper prior to the start of the 2013 season. 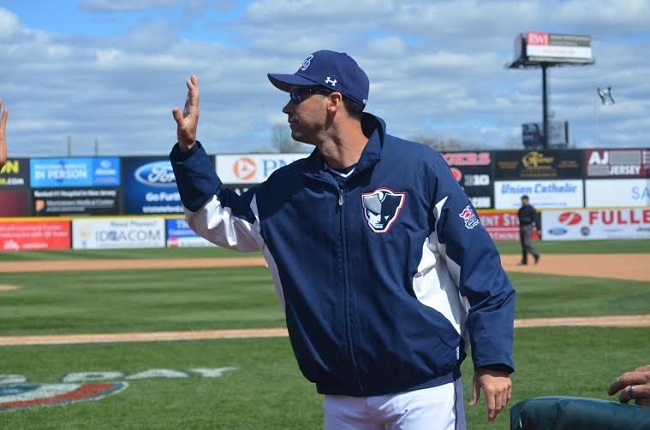 The Patriots have made the postseason in each of Jodie’s three seasons at the helm, including two Championship Series appearances, in which Somerset has won once; they captured their league-record sixth title by defeating the Southern Maryland Blue Crabs earlier this month. He recently became the fastest manager in league history to reach the 250-win plateau, and owns a career 264-154 regular season record. There is, to be sure, a lot to brag about. But the always humble and genuine leader simply isn’t wired that way. Although Jodie was, not surprisingly, reluctant to speak about himself, others were quick to praise him. “Brett is as deserving of this award as anybody ever can be,” general manager Patrick McVerry said. In addition to the league’s Manager of the Year award being announced on Tuesday afternoon, the postseason All-Star Team and both Pitcher and Player of the Year were revealed.